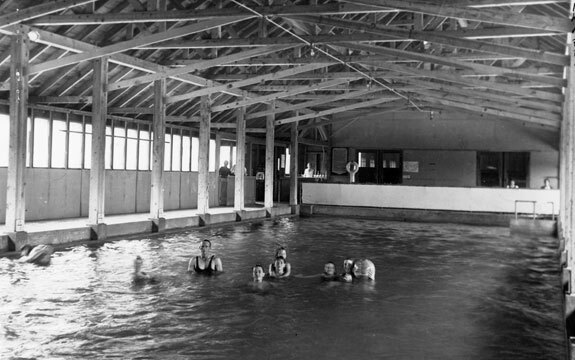 Above: Pan Hot Springs circa 1925 read more at the Big Bear Lake Resort Association website. 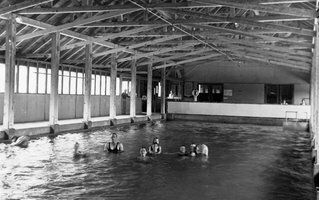 I am happy to say that Ray dropped by to leave comments regarding the progress of Pan Hot Springs. Ray, I certainly hope that all goes well and that you do get open next year! I am going to make it a point to drop by and celebrate by swimming. For those of you who don’t read the comments…this is your notice to do so–and while you are at it–leave a comment! I am enjoying the weather change and hope you are too. It reminds me that fall is right around the corner. Down the street the neighborhood gang is working on their wood stash. Everyone works together and shares the wood when done. Good going. Me, I am just plain tuckered and don’t have much motivation for anything extra at the moment. Guess I have to get going on the winter preparations too. On another completely different note, I want to ask some of you to submit some of your favorite stories about local hiking areas and other activities. I know at least one of you reading does a restaurant review blog and would love to know what places you think are the best. Maybe we can do some cross posting? Rocco never committed to doing the forestry log after I set it up nor have I heard from the lady who wanted to do the history of Fawnskin. However, I keep hoping that some of those things will materialize in the future! This entry was posted on Wednesday, September 5th, 2007 and is filed under Uncategorized.